What Are the DNC Hack(s) Rated on Obama’s New Cyber-Orange Alert System? Yesterday, President Obama rolled out yet another new cyber-directive, this one aiming to better coordinate response to attacks. 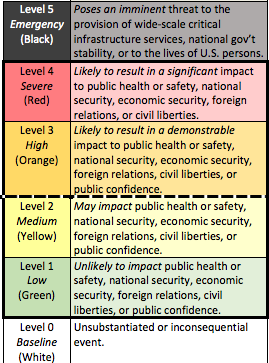 (PPD, annex, fact sheet) Along with all that, the White House released a guideline on the ranking of cyberattacks, including the Orange Alert type table that reminds me of Tom Ridge’s discredited system. I’m going to post at more length about this prioritization system and the PPD. But for the moment I wanted to post the table separately to ask what you think the DNC hack(s) (remember there were two) would rank on the system. My guess is the initial hack (APT29, alleged to be FSB) would be Level 1 or even 0. State actors spy on political parties all the time, and that’s all we’ve been told APT29 was doing. The real question is APT28, which is the hack alleged to have ties to Guccifer and therefore to the Wikileaks posting of all the emails. It’s not yet clear the hack was intended to elect Trump (assuming it is Russian); I think it more likely to be retaliation for the Ukrainian coup. It’s not clear how important it will be on the election (and I expect more damaging documents to be released closer to the election). And it’s not clear how much this really has affected public confidence. The question is still more problematic if you try to grade the OPM hack, which has to be far closer to a Level 4 (because of the risk it placed clearance holders under). But do you also lump it in with, say, the hack of Anthem, which is understood to be related? I will ask the White House tomorrow if it has ranked the DNC hack(s). But for now, where do you think it would rate? https://www.emptywheel.net/wp-content/uploads/2016/07/Logo-Web.png 0 0 emptywheel https://www.emptywheel.net/wp-content/uploads/2016/07/Logo-Web.png emptywheel2016-07-27 18:22:522016-07-27 19:08:11What Are the DNC Hack(s) Rated on Obama's New Cyber-Orange Alert System? Agreed: these ‘hacks’ are entirely beneficial. Or perhaps that is going too far: they contain evidence, aplenty, of wrongdoing much of which verges upon criminality. It may be that the means by which this information has been brought to light will make prosecutions more difficult. I doubt it, however. Maybe I’m cynical but I suspect that this sort of thing-cheating the State Democratic campaigns, selling access etc, happens all the time. Not unlike what happened to the late Freddie Gray. Do you support reparations for descendants of the slaves? Yellow on the second DNC hack, because of the “public confidence”; Green on the first. If you believe in nsa2, then infrared. If you just think I’m a conspiracy nut, then ultraviolet. I am not trying to split hairs, or twist meanings but I am curious how hacks impact (the levels one through four) civil liberties. Unless it is by our own government(s). I think you could definitely say that it resulted in a demonstrable impact to public confidence, so I suppose you could say Orange. But any embarrassing leak or whistleblowing will do that. Does anyone else see how Orwellian this fear alert system is especially if applied to anything like the DNC hack? Some people here seem to be falling in line to accept the warped idea that exposing the truth is a threat and people need to be warned and fearful. If the DNC hack is included in this threat assessment warning system the more truth we are exposed to the more Big Brother will threaten our health and safety. I don’t see the wisdom in advertising how much one was hurt to one’s enemies. What is the added value, really, to have this out in the open? Possible jury influence for espionage trials? I have never seen any wisdom coming from our rulers but they are cunning. The real enemy this fear warning system is directed at is the truth and the people who might be exposed to it and become enemies of the state. I’m reminded of Tom Ridge’s color coded threat level that was used exactly that way. The difference I see here is that instead of anticipating trouble and being on the lookout in the malls and some of the ridiculous places offered by Shrub’s noise machine, this policy is more an assessment announced after the fact. What’s prevented here? 38.6 Who are the, “cunning,” people? 38.7 Why won’t you name them? 38.1 How could they, without disagreeing with emptywheel? 38.2 Who, “here,” is disagreeing with emptywheel? What is the threat from knowing unethical or criminal behavior influencing elections? To the contrary. I want that information exposed and punished. As to public confidence, the quicker than folks in power are hammered for their bad behavior, the more confidence I have in our governments. You want what many people want but we have to depend on the people who will be punished if caught or demonized if foreign to provide this information because our system is maintained by unethical and criminal behavior. Confidence in our government died on November 22, 1963 along with a president, we now live under a regime of lies, fear and intimidation and the only thing we can be confident about is more of the same. I totally disagree about 11/22/63. Unless you have some unquestionable evidence that JFK’s death was an inside job, that’s all mythology and conspiracy theories. A straightforward act destroying trust in government was Ford’s pardoning of Nixon. Right out in front of god and everybody. No guessing. No conspiracy theories. President Kennedy took an oath to defend the Constitution. 38.3 Are you, “…falling in line to accept the warped idea that exposing the truth is a threat and people need to be warned and fearful,” or do you have a path to a solution? I wonder if restaurants in DC get popular so that most of the people know generally who each other are, and thereby reduce the potential spy-at-the-next-table risk.